Elgee offers a full line of Accessories to enhance unit functionality and Spare/ (put space here) Replacement Parts for your Power-Vacuum. In some cases, a cleaning solution may require non-standard accessories. In those situations, please contact us, as we do offer Accessory Customization. Below are some of our more popular accessories and parts. Accessories can be purchased on your original Power Vacuum order or, in most cases, they can be ordered in the future. They can be purchased by contacting us by phone at(800) 742-0400. Tow Bar Ideal for transporting a power vacuum short distances at low speed. The Tow Bar easily attaches to the Power Vacuum and is available in 30″ and 40″. (Part #: TK-01) **NOTE: We recommend also purchasing the FW-40 (Outboard Castor Wheels) with this product, for additional stability. Custom Accessories upon request. 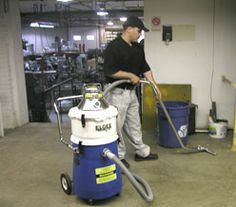 If our standard products cannot meet your required cleaning solutions, contact us for possible customized accessories. If you don’t see something you need, please contact us and provide us with the details of your requirements. If you have any questions about a part, please contact us at (800) 742-0400. Accessories and parts are subject to change. Models and style may also change.